Yes, Kotomitsuki finally made it. Since his first steps as a professional, the former boarder of the famous sumo club of Nichidai university raised the greatest hopes. Born in 1976, the year of the dragon, together with Chiyotaikai, Tochiazuma and Wakanosato, he formed a quartet of dragons that the press saw dominating sumo. They did not count on the blossoming of a Mongolian, even younger than them... So, Kotomitsuki had to wait until his third attempt to become Ozeki at the age of 31 years and 3 months. Reaching this, he achieved a record and became, on July 23rd, the oldest fighter ever promoted to Ozeki, dethroning old Ozeki Masuiyama. Far from being disappointed, he was the happiest rikishi after this Nagoya 2007 tournament, because he dreamed of offering this promotion to his former Master, yokozuna Kotozakura. He did well to do so, since Kotozakura died on August 14th, barely three weeks later. Let us review the career of the new Ozeki, who was at one time considered to be Asashoryu's greatest rival. Ozeki Kotomitsuki's real name is Keiji Tamiya. He was born in the prefecture of Aichi, close to Nagoya, and in his youth he did amazingly well in competitions of wanpaku-zumo. His reputation spread even beyond the area of Nagoya, where he polished his sumo in college. 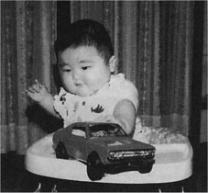 In competitions, young Keiji Tamiya came across future professional fighters like Takanohana, Tochiazuma or Takamisakari. But after finishing college, he chose to join a university rather than the professionals. To continue his training, Keiji Tamiya entered the "Champion factory" - the sumo club of Nichidai University, directed by Mr Tanaka. The Nichidai club had a lucky time; among its members one could find four future Sanyaku: Hayateumi, Futeno, Takamisakari and Kotomitsuki. These exceptional fighters, all in one generation, made the Nichidai club a practically invincible armada, which would win nearly all academic qualifications, in both the team and individual competitions. 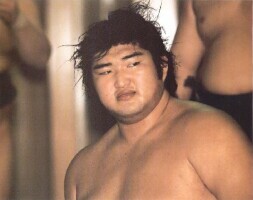 Young Keiji Tamiya was far from being the least talented of this group and took down the university title of yokozuna, which enabled him to make his professional sumo entry directly into the makushita division. 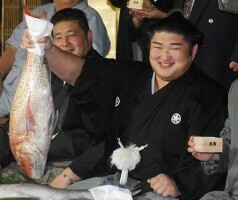 He already was an experienced fighter when he entered Sadogatake-beya just before the Haru basho 1999. Taking the shikona of Kototamiya, he did not stay in makushita long and was promoted to sekitori after only four basho. He then got the new shikona, "Kotomitsuki" and remained only three basho in the juryo division before his promotion to makuuchi. 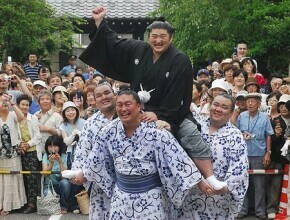 Because of an injured left ankle, he couldn't take part in the Natsu basho 2000. He made his return in the Kyushu basho with a fabulous record of 13-2. It was Akebono who won that basho, but everyone knew that Kotomitsuki was able to win a yusho as well. Precisely 10 months later, that is what he did at the Aki basho 2001, and everyone expected to see him soar quickly towards the rank of Ozeki. At the beginning of 2001, the quartet of dragons showed its full quality. Tochiazuma and Chiyotaikai became Ozeki, with Wakanosato already sekiwake. Kotomitsuki, not wanting to stay apart, gained 34 victories over three tournaments. But to everyone's great surprise, the NSK decided not to grant him promotion to Ozeki after the Haru basho 2001. In the following tournament, he fractured his jaw, and while Asashoryu showed an impressive progression, Kotomitsuki was hampered by his elbow injuries, which started to demoralize him. But his Oyakata, who had sworn to himself to make Kotomitsuki an Ozeki, looked after him in the right way. Kotomitsuki showed notable performances with records of 13-2 in 2004 and 2005, but with a brilliant yokozuna, he had no chance of winning another yusho. And when Kotooshu, his junior at Sadogatake-beya got promoted to Ozeki, the experts thought that Kotomitsuki was satisfied with the sekiwake rank he had held since the 2004 Haru basho. But he wasn't! Incited, and seeing the devotion of his former Oyakata now retired and quite ill, Kotomitsuki was finally able to show high level performances, and, before his fans in Nagoya, he had a good basho, enabling him to gain 35 victories over three grand tournaments. This time, the attempt was successful and the Ozeki Kotomitsuki was born. With the absence of Asashoryu for two tournaments, he could even get higher. We wish him well. Let the dragon spit his flames!